Most people buy lottery tickets hoping to gain something. For Denny Hughes, it became a catalyst to give stuff away. The retired Farmington Hills firefighter and a group of others from lower Michigan delivered roughly $400,000 worth of used firefighting equipment to Iron Mountain on Thursday afternoon, to be divided among more than two dozen smaller fire departments in the region. The Iron Mountain Fire Department is serving as distribution site for the equipment, which drew interest from as far away as Houghton and Gogebic County, said Jeff Friedenstab, the Iron Mountain deputy director of fire services who learned about the downstate program at a recent conference. While Iron Mountain has a decent budget for their gear, Friedenstab knew of the need in some of the neighboring departments. He was put in touch with Hughes, who was “honored” and game to visit the western Upper Peninsula after making three trips to the eastern side in the past year. Back, from left, Denny Hughes, retired firefighter and senior account executive for Belfor Property Restoration, Jeremiah Jacobson, Chad Hedmark, IMFD, Justin Diaz, Rainy Harless, John deBidart, IMFD, Jim Owen, IMFD; front, Mike Longnecker, a former firefighter from Jackson, Tyler Skoglund, IMFD, Tom McCarty, IMFD, Rob Blazier, IMFD, Tom Mantsch, John Graber and Ray Ahonen, of Belfor, pose with the truck loads of firefighting gear delivered to the Iron Mountain Fire Department on Thursday afternoon. “He had never been up this way before,” Friedenstab said. The effort started in September 2017 at the Michigan Fire Inspectors Fall Conference at Michigan State University, after longtime friend and Raber Township firefighter Bruce Johnson asked Hughes to buy a raffle ticket. Hughes, who works for Birmingham, Mich.-based Belfor Property Restoration, initially agreed to take two tickets but balked when told they were $50 each. Hughes couldn’t believe the fire department was functioning without basic equipment. “They were using rubber gloves and stuff they shouldn’t be using to fight a fire,” he said. The lack of gear, in turn, was making it hard to recruit new members. “I said, ‘If I can get you 25 helmets, coats, boots, and gloves, would that help? '” Hughes said. About 375 state-certified fire inspectors were at the meeting that day, so Hughes looked around the room. As a public safety liaison representative for Belfor, his entire day is spent interacting with fire and police chiefs, and emergency managers, so he had a few connections in mind. “It was the second week in September, and I knew grants were awarded in June and July, so there had to be excess gear in stock somewhere,” he said. Where does that used gear generally go? One of three places, he said: Dominican Republic, Mexico — or a dumpster. Sending out text messages, Hughes began to round up used gear from Lansing Township, Flint, Livonia, Farmington, West Bloomfield and so on. The departments agreed to donate jackets, boots, old air tanks, fire hoses, thermal imaging cameras, even extrication equipment. “By the end of the day we had hundreds of sets of gear from all over the Lower Peninsula,” Hughes said. Because Belfor CEO and owner Sheldon Yellen “couldn’t be more supportive of any group of people anywhere in the world than firefighters,” he said “absolutely” when Hughes asked to borrow a truck. 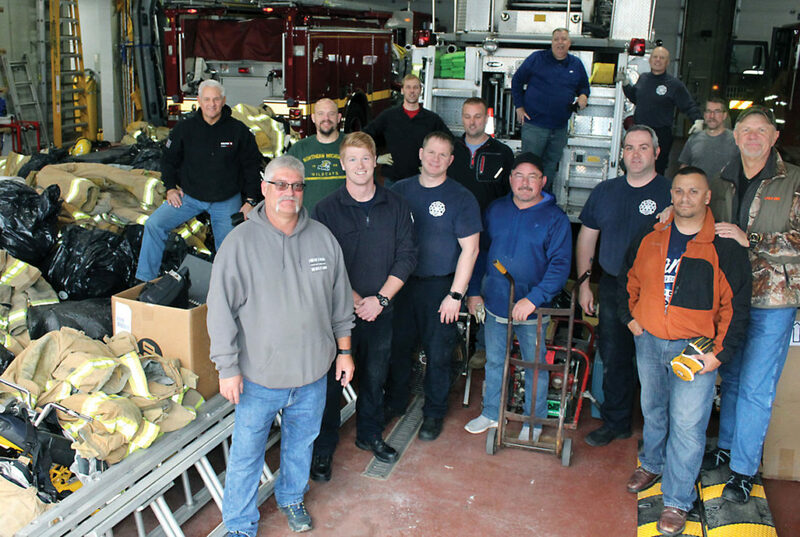 It allowed Hughes and few other volunteers to deliver a truckload of firefighting equipment and gear to the Raber Fire Department almost 300 miles away. So when Hughes got the call from Friedenstab, he was happy to help. 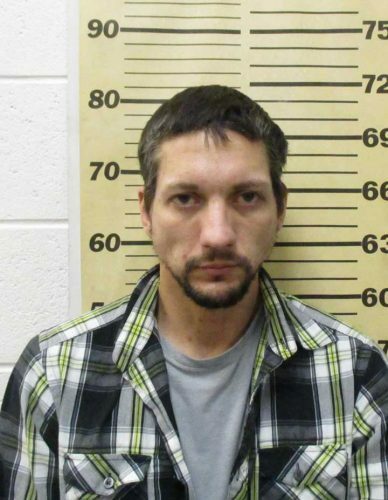 Belfor again allowed Hughes and Ray Ahonen, another Belfor employee, to use the company’s box trucks to haul the equipment. “Our boss allows us two days off. They pay for our gas, they pay for our meals. The other guys here are all on their own dime. Everybody here is either an active or retired firefighter,” Hughes said. It took about two hours for 14 guys to unload the trucks and trailers. 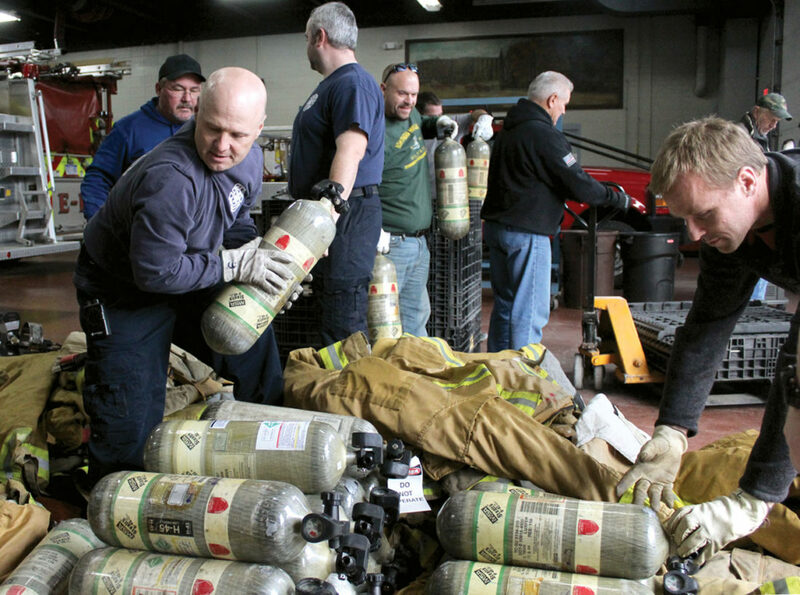 The department now is busy sorting the items — turnout gear, air packs, hand tools, adapters, fittings, chainsaws, portable pumps — for distribution to several different departments in the Upper Peninsula and northern Wisconsin. “It’s all expensive,” Iron Mountain Firefighter Chad Hedmark said. “The air packs are fairly new and they cost about $6,000 apiece; we received 75 to 100 of those,” he said. The shipment also included four sets of Jaws of Life extrication equipment that cost $30,000 each when purchased new. Hedmark said the local firefighting community can check Iron Mountain’s Facebook page early next week for details on how to obtain some of the gear. “I think it is a wonderful program, that they came all this way, and donating their time. I think it’s great,” Friedenstab said. Although Hughes had visited the U.P., this was as far west on U.S. 2 that he’s been, he said. He intends to continue the mission wherever there is a need — and to work on a “catchy name” for the program. It was suggested he just collect gear and have department come get it, but for now enjoys the road trips too much. Theresa Proudfit can be reached at 906-774-2772, ext. 45, or tproudfit@ironmountaindailynews.com.